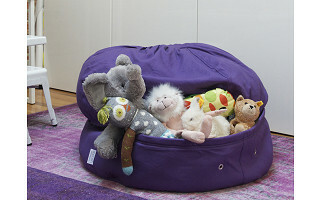 Storage Beanbags chairs by Mimish Designs are a cozy and functional solution for storing your kids' stuff. These beanbags do double duty as a comfortable seat and a clever container. So innovative is the design, it won 1st place in a "Shark Tank" contest on Katie Couric's daytime talk show. Mimish Designs was founded by Andrea Soto, a New York mom who's used to maximizing small living space. Soto believes clutter is physically and mentally problematic, staying with us even when we walk out the door. The Storage Beanbag was inspired by her passion for design and need to organize. With cushy beans on top and a zipper in the middle, these chairs make it real simple to tuck clothing, blankets, and even stuffed animals out of sight. Made right here in America, these high-quality, cotton beanbags brighten and tidy up any room. They can also be used as an ottoman. Just unzip, declutter and relax. Do you struggle to find the space in your home/apartment/dorm room to put extra bedding, stuffed animals and seasonal clothes? Here's a fun way to help keep everything organized. I am available today to respond to questions and comments. Love it. Thinking of getting one for my college age son for his dorm. You think it's durable enough? @Elijah Yes, definitely durable. And the micro suede is fully washable too. @Andrea, do I understand correctly from looking at the video that you MUST keep things that are soft and crushable in the bottom? That it, it looks like the compartment is soft sided, so you can't leave anything rigid in it, and you can't leave it empty either unless you want to sink way down. Is that correct? Any thoughts of having a hard-sided, crush-proof compartment with beanbag on top? @Heidi Yes, it's mostly for soft items. And we do recommend filling the compartment with a lot of stuff. And yes, If you leave it empty it is like a beanbag with roughly half the beans. If you pack it with hard stuff, like books, then you can still use it as an ottomon to put your feet up. But I wouldn't recommend doing this if you have kids or people jumping on it. 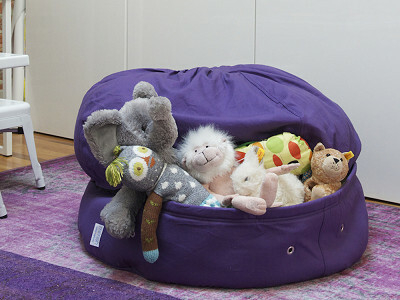 Storage Beanbags chairs by Mimish Designs are a cozy and functional solution for storing your kids' stuff. These beanbags do double duty as a comfortable seat and a clever container. So innovative is the design, it won 1st place in a "Shark Tank" contest on Katie Couric's daytime talk show. 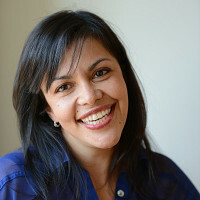 Mimish Designs was founded by Andrea Soto, a New York mom who's used to maximizing small living space. Soto believes clutter is physically and mentally problematic, staying with us even when we walk out the door. The Storage Beanbag was inspired by her passion for design and need to organize. With cushy beans on top and a zipper in the middle, these chairs make it real simple to tuck clothing, blankets, and even stuffed animals out of sight. Made right here in America, these high-quality, cotton beanbags brighten and tidy up any room. They can also be used as an ottoman.